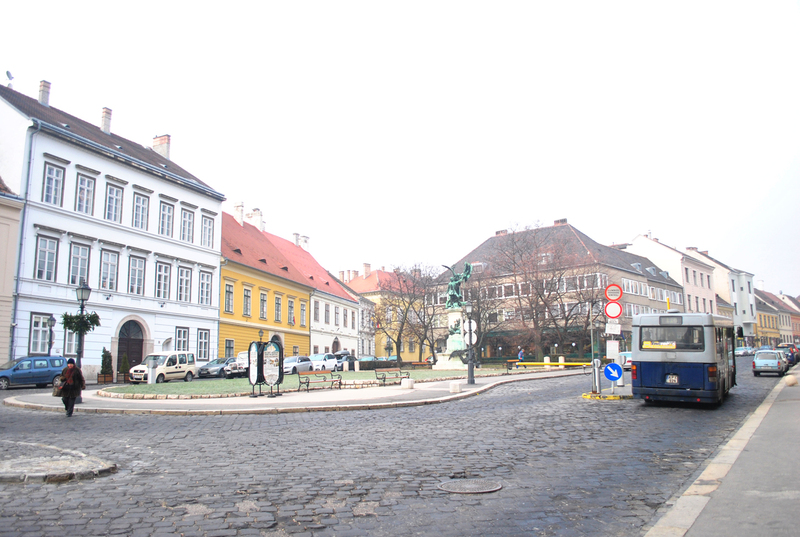 With Prague, Český Krumlov and Vienna behind us now, we headed for Bratislava, the capital of Slovakia and a city that shares the border with Austria and Hungary, in the morning of December 21. It was a comfortable two-hour ride by coach, and I was asleep most part of the journey. Occasionally I would wake up to dreamy views of snowy slopes and cottages with smoke spiraling from their chimneys. 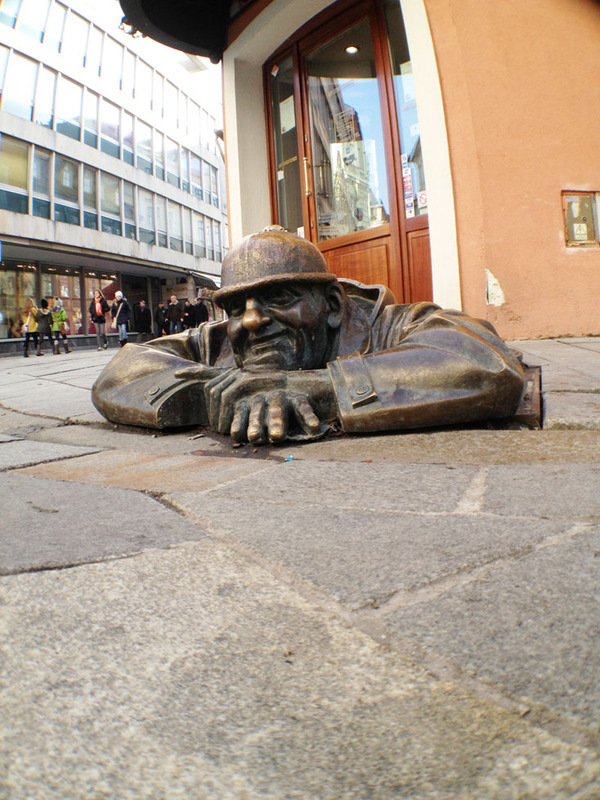 Once the capital of the Kingdom of Hungary and an important territory of the Hapsburg empire, Bratislava also boast beautiful architecture, although most of the prominent historical ones are found in the old town. The way leading to the old town, where we spent the morning, was lined with bald trees and paved with stones. The old town burst into life at the end of the quiet avenue, filled with people of all ages gathered around stalls selling all sorts of things, from hot wine and grilled meats to handmade fragrant soaps and adorable knitted caps. 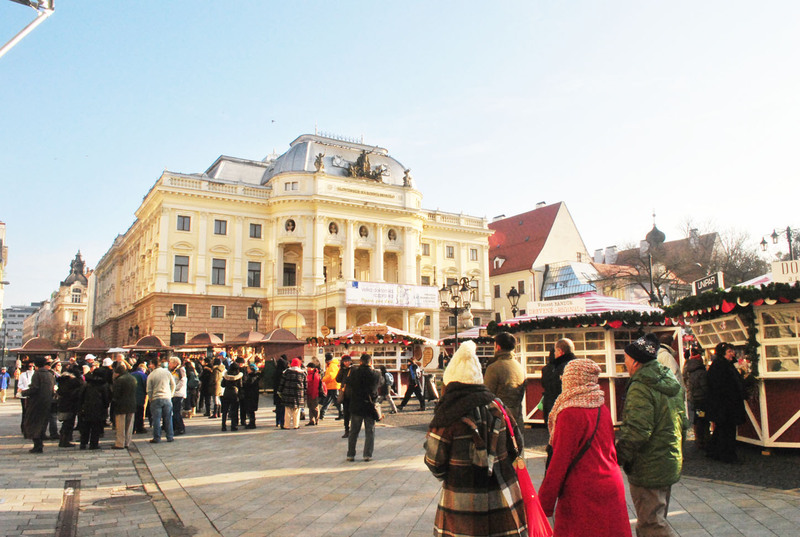 The things sold here were of a greater variety compared to the Christmas market in Prague’s Old Town Square. We were left on our own to walk around and the husband and I made some new friends – specifically Čumil the workman and a paparazzo! 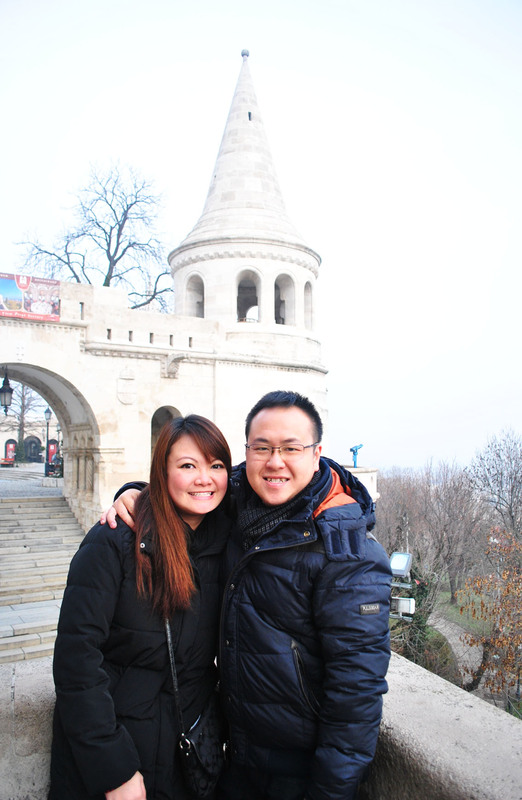 Done with fun in Bratislava, we continued our journey to Budapest, our final destination in this tour. It was late afternoon when we arrived, and since we did not sign up for the optional river cruise and dinner event, the husband and I took a walk around the hotel for a look-see. 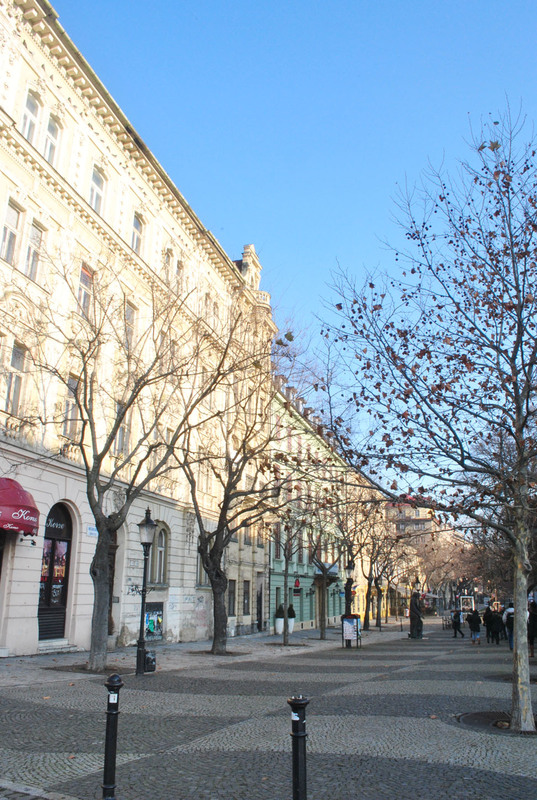 We stayed at the new Hilton Budapest West End, conveniently located within the West End Shopping Mall and walking distance from Andrássy Ut where all the luxury boutiques are. However, we chucked shopping at the back of our minds though, as the husband had a mad craving for Asian food. Fortunately, I spotted a busy Thai restaurant along the road while we were on the coach earlier on. It turned out to be a long walk from the hotel, but it was worth it. We got to see the city and the fried noodles, although not authentic, had wok hei (the smokey essence attained by food being stir-fried on high heat). Again, we ended our night with local beers at the hotel’s lobby lounge. The next morning, we paid some heroes a visit. 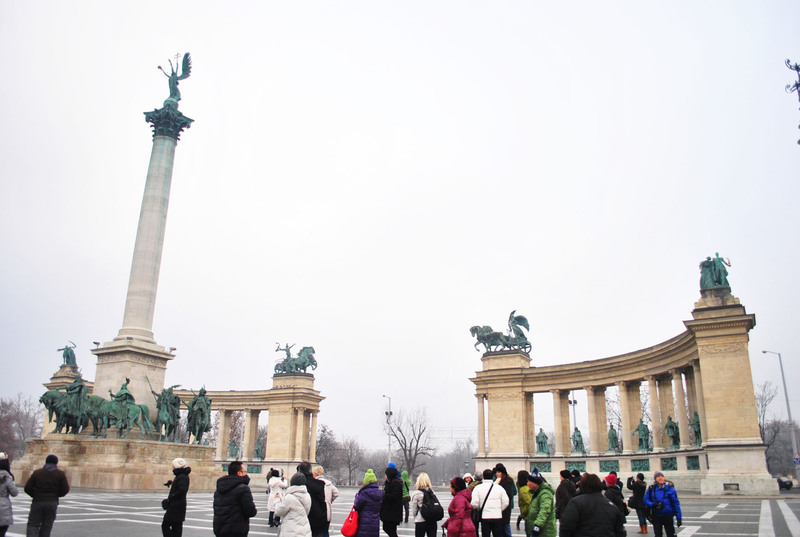 Our local guide took us to Heroes’ Square, or Hősök tere, a sprawling space with statues of people who played a critical role in Hungary’s past. I would have loved to stand here with a cup of hot coffee in my hands – perfect on a -7°C morning, and just take in the space and splendour. But the group had to hurry off to somewhere else, as is always the case with guided tours. 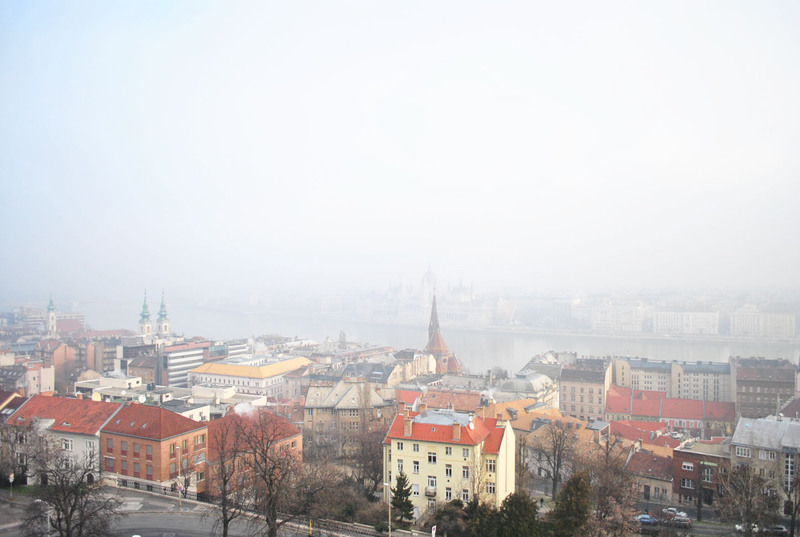 From Heroes’ Square, we left the Pest side of the Danube river for the hilly Buda area. 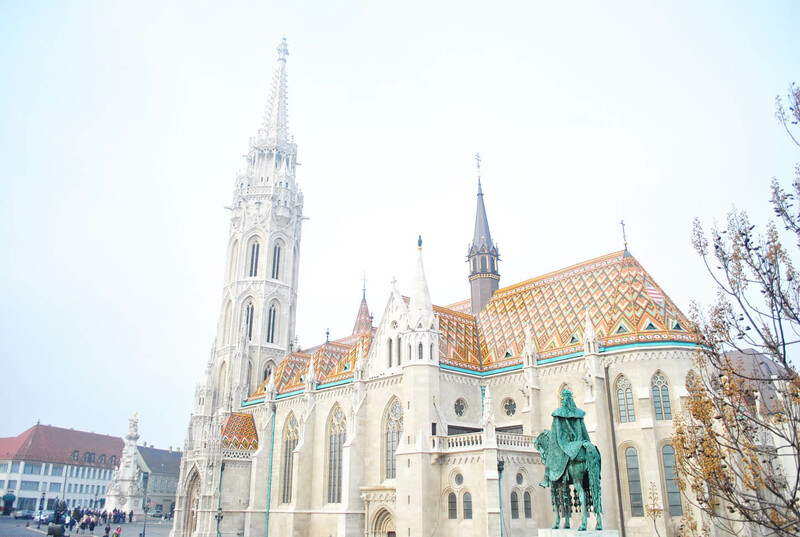 Once we got to Buda’s Castle District, we made our way on foot to Matthias Church. 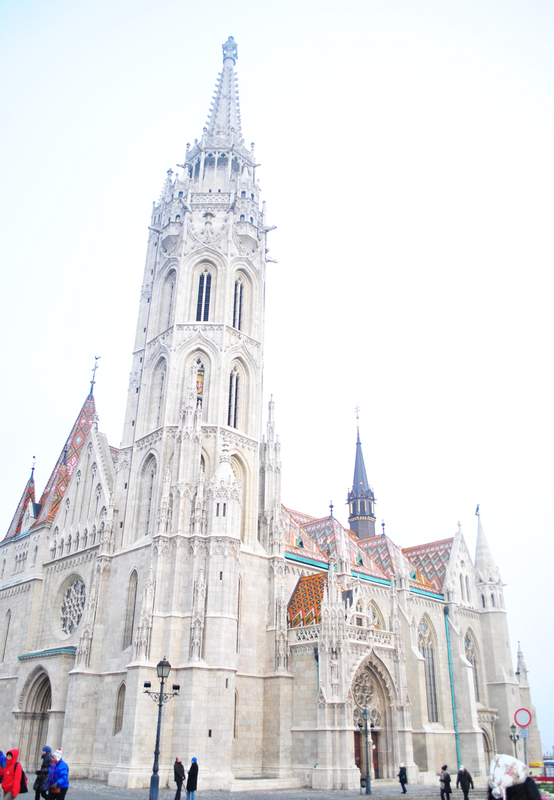 Then the gothic Matthias Church loomed into view and took my breath away. Visitors are allowed within, but the interior is undergoing restoration, rendering some parts of the church blocked from view. 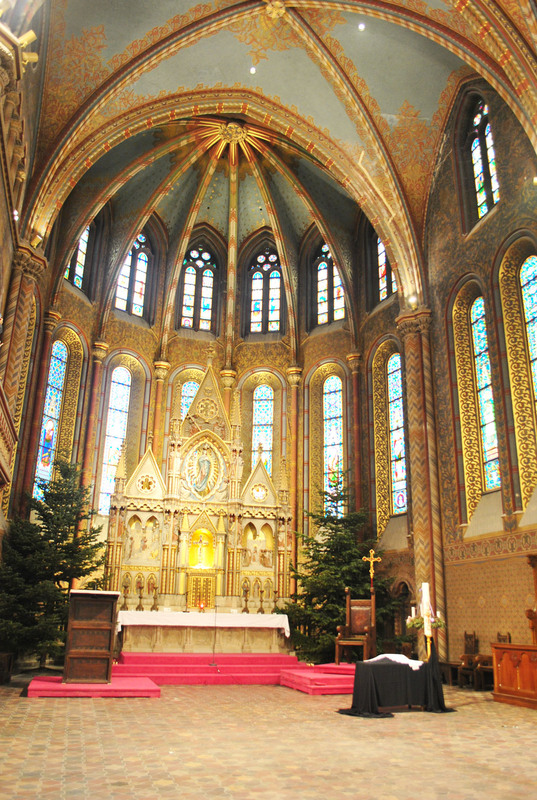 Still, one is able to appreciate the gilded interior. 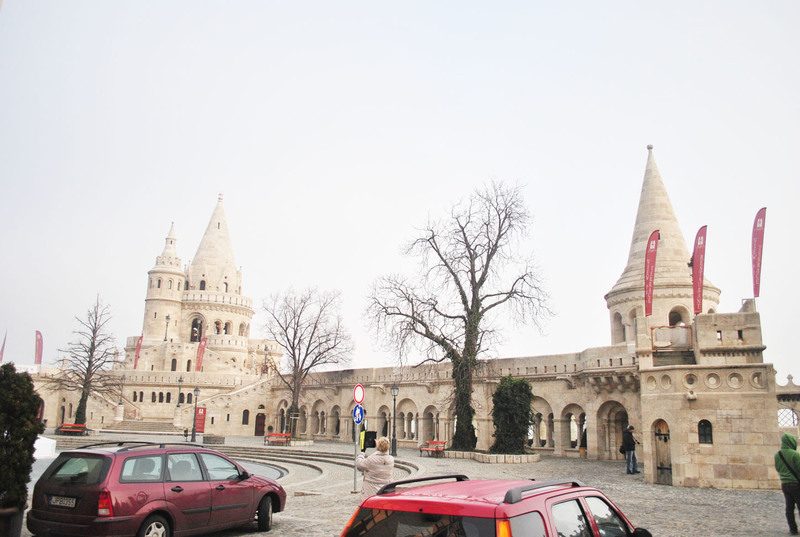 Stepping out, we found ourselves face to face with an impressive terrace – the Fisherman’s Bastion – that overlooks the bottom of Buda and the cityscape of Pest. 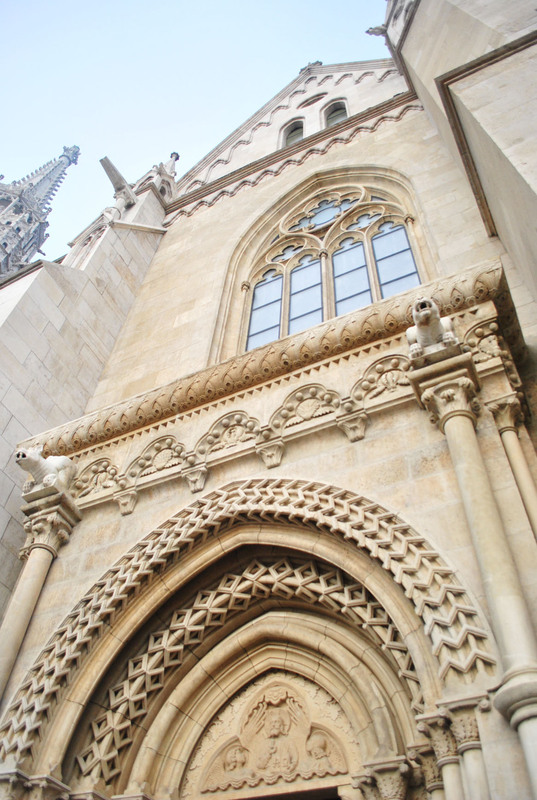 Fisherman’s Bastion also offers a different view of Matthias Church, with the statue of St Stephen in the foreground. 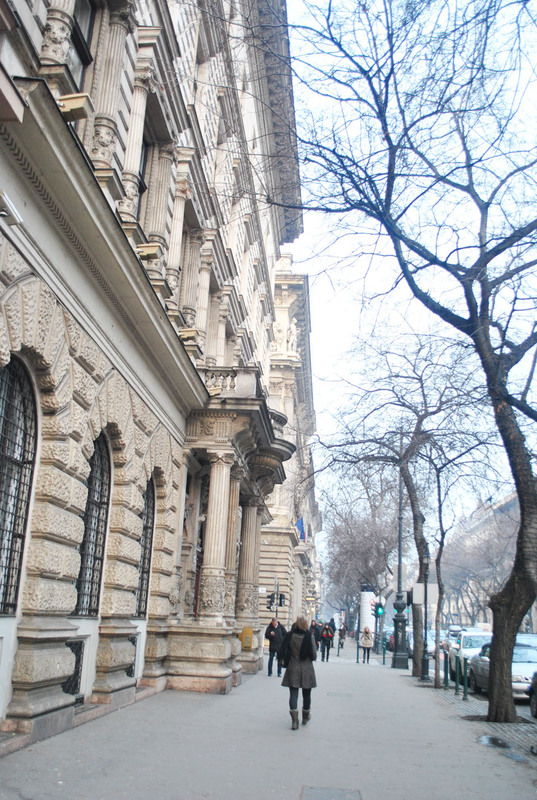 The city tour of Budapest was rather brisk, and the programme ended at the point between Sofitel Budapest Chain Bridge and the Christmas markets. Instead of looking for food at the Christmas market again (the husband had enough of sausages! 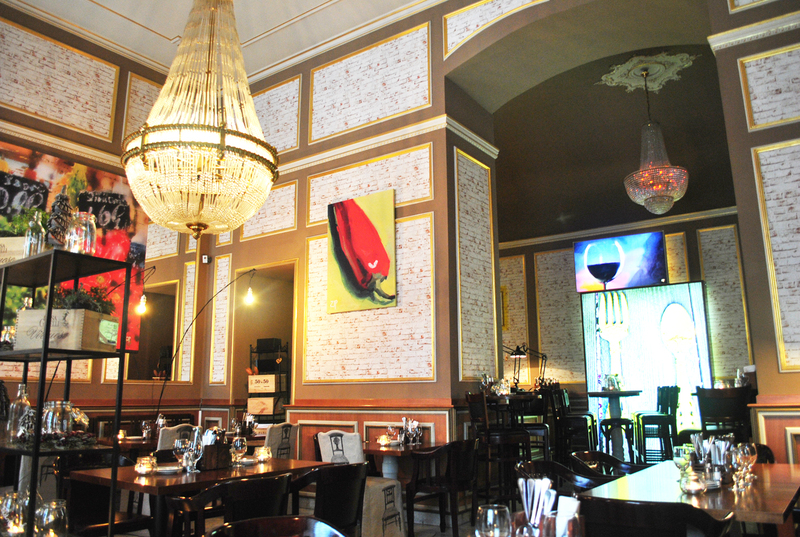 ), we slipped out of the biting cold and into the warmth of a proper restaurant for a good lunch. 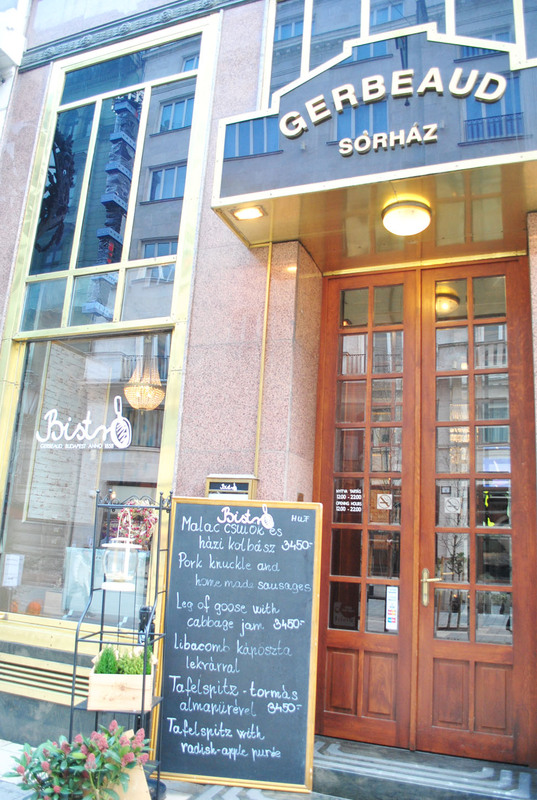 Gerbeaud, established in 1858 and is said to be the most traditional coffee house in Europe. But we didn’t go into the cafe side. Instead, we visited the bistro for lunch. 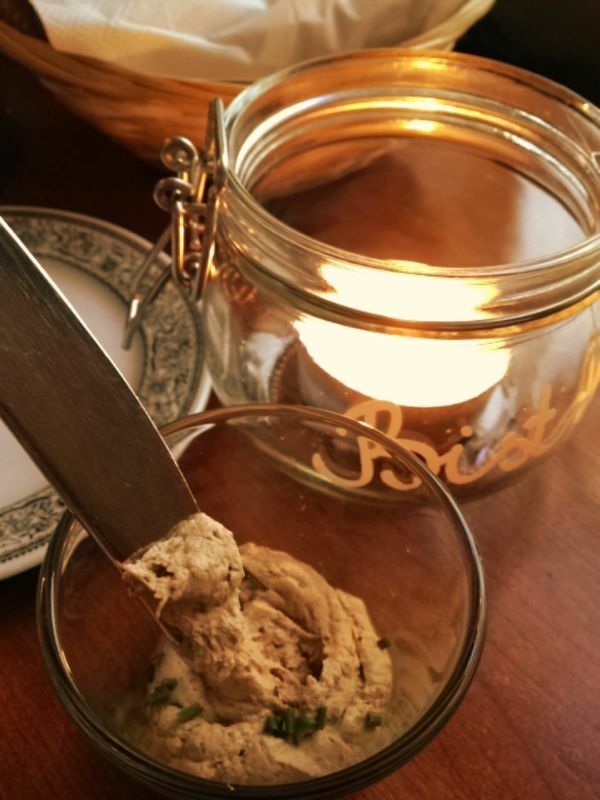 While we pondered the menu, a basket of hot bread and savoury chicken liver pâté were served. The husband loved it until he was told that the spread was made with chicken liver. Hah. We warmed our tummies with soup. 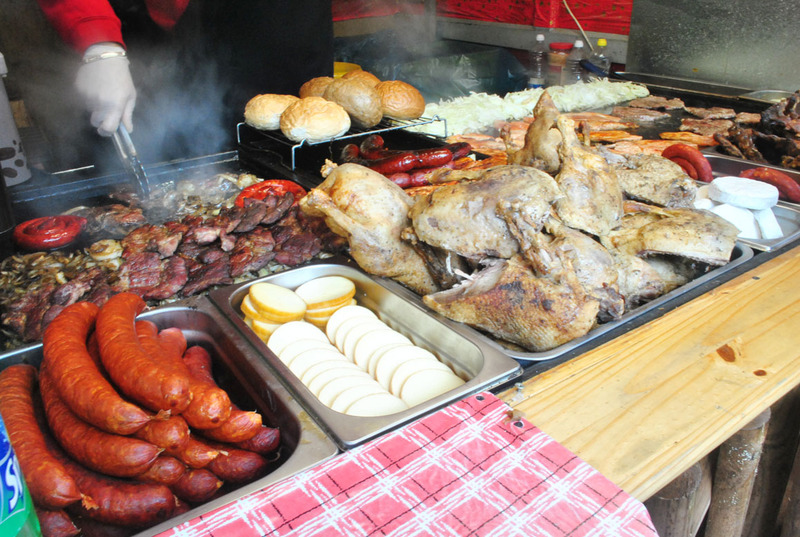 I was told that Budapest is renowned for its goose and goose liver. As the husband is no fan of the latter, I chose a roasted leg of goose so that he could also pick from my plate, while he ordered a beef steak with potato mille-feuille. It was a lovely meal, and we ate slowly, sipping our wine, reminiscing the earlier days of the trip and watching the world go by outside. After lunch, we shopped around the Christmas market for presents, and realised the market in Budapest was by far the best that we had encountered on this trip. There were so many lovely things to buy – paper puppets and cut-out theaters, traditional hand-bound notebooks and diaries, quirky glassware, handmade chocolates and Christmas cookies. Very pretty, but rather pricey too. 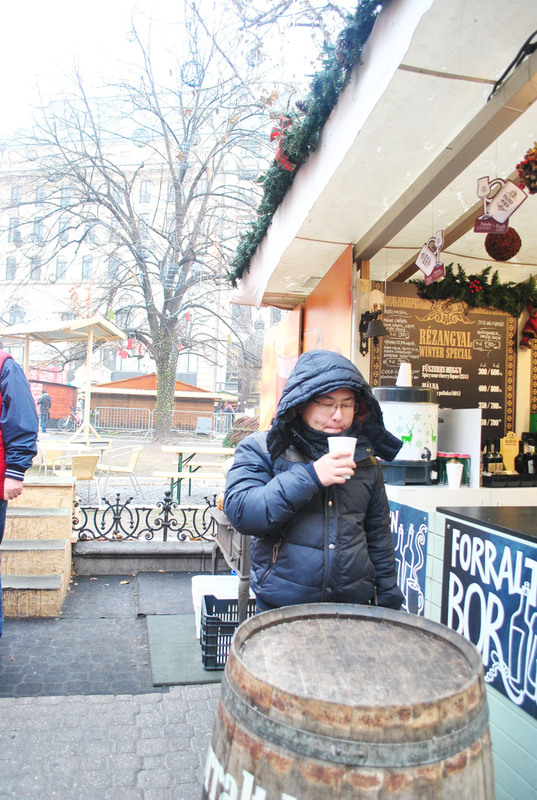 When the cold got too much to bear, we stopped for a cup of hot punch. Yummy! These drinks are so addictive, and with the load of sugar in them, they give you such a happy buzz. If I was nimble, I would be leaping off walls. With the day dedicated to shopping, we left the Christmas market and sought out Andrássy Ut, where a Gucci boutique stands. 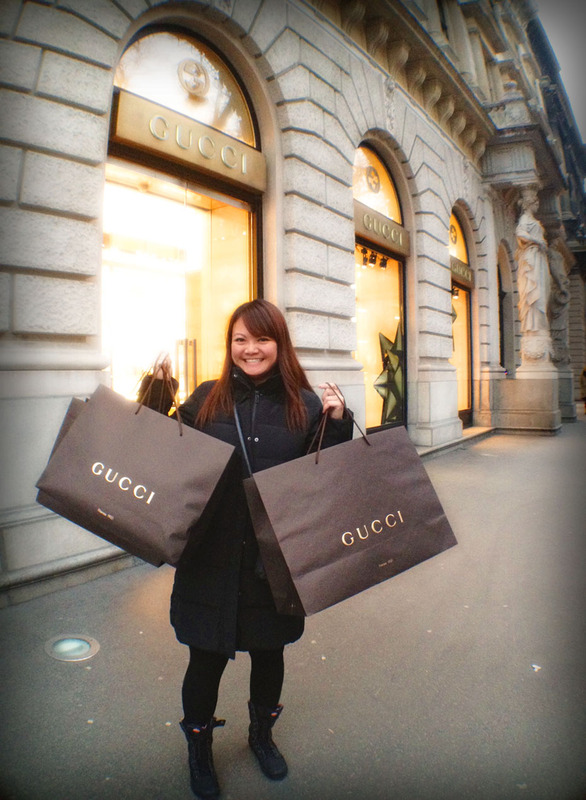 And there, I managed to get my Gucci fix. Woohoo! We had just over an hour to rest our feet back at the hotel later on, before regrouping with the other tour mates for a farewell dinner in a restaurant on Gellért Hill.